A Sedco 700-class semi-submersible drilling rig was to be moved from its lay-up location in Scotland to Singapore to be converted into the LIUHUA 11-1 Floating Production System vessel (FPS). Argonautics Marine Engineering, Inc. was hired by Reading & Bates Development Company to compare the various transport options: wet tow or dry transport. For the dry transport option, stability and motion response analyses of the potential carriers, and a detailed structural analysis of the rig were performed. Safety aspects and commercial implications of each option were addressed. Within the boundary conditions, the wet tow turned out to be the more favorable option, see also photograph below. 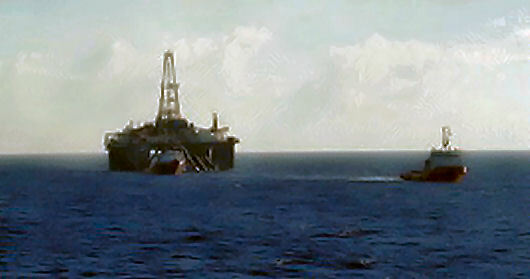 The rig departed Scotland in April 1994 and was safely delivered to the FELS shipyard in Singapore. ■ Present all findings and conclusions to the project team management.